Adrienne Crossman and Thirza Cuthand are two artists who are breaking down barriers in their media artwork. They will each present their work as part of the Mobile Experience Lab's Art Intersection Meetup, a place for artists, moving image-makers, gamers and technologists who are experimenting with art-related digital content and how the moving image is presented in a connected world. Digital culture, social media and networks encourage new ways of storytelling, image making, idea sharing and collaboration. This Meetup celebrates artists and innovators who are embracing change leading the next wave of creativity. Adrienne Crossman is an artist, educator and curator. She holds a BFA in Integrated Media and a Minor in Digital and Media Studies from OCAD University. She has completed residencies in Syracuse, NY, Montréal, Windsor, and Artscape Gibraltar Point on the Toronto Islands. Her practice involves the manipulation and deconstruction of digital media and popular culture in order to create new artifacts through formal re-interpretations. In the pursuit of creating a queer aesthetic, Crossman's work is concerned with the exploration of non-normative and non-binary spaces, while attempting to locate queer sensibilities in the everyday. Adrienne is currently an MFA candidate in Visual Art at the University of Windsor. Thirza Jean Cuthand was born in Regina, Saskatchewan, Canada, and grew up in Saskatoon. Since 1995 she has been making short experimental narrative videos and films about sexuality, madness, youth, love, and race, which have screened in festivals internationally, including the Tribeca Film Festival in New York City, Mix Brasil Festival of Sexual Diversity in Sao Paolo, Hot Docs in Toronto, ImagineNATIVE in Toronto, Frameline in San Francisco, Outfest in Los Angeles, and Oberhausen International Short Film Festival in Germany where her short Helpless Maiden Makes an ‘I” Statement won honourable mention. Her work has also screened at galleries including the Mendel in Saskatoon, The National Gallery in Ottawa, and Urban Shaman in Winnipeg. She completed her BFA majoring in Film and Video at Emily Carr University of Art and Design, and her Masters of Arts in Media Production at Ryerson University. In 1999 she was an artist in residence at Videopool and Urban Shaman in Winnipeg, where she completed Through The Looking Glass. In 2012 she was an artist in residence at Villa K. Magdalena in Hamburg, Germany, where she completed Boi Oh Boi. In 2015 she was commissioned by ImagineNATIVE to make 2 Spirit Introductory Special $19.99. In the summer of 2016 she began working on a 2D video game called A Bipolar Journey based on her experience learning and dealing with her bipolar disorder. It showed at ImagineNATIVE and she is planning to further develop it. She has also written three feature screenplays and sometimes does performance art. She is of Plains Cree and Scots descent, a member of Little Pine First Nation, and currently resides in Toronto. Presented by Akimbo, Gamma Space, OCAD University and Charles Street Video. Supported by Social Science and Humanities Research Council. Caroline Seck Langill is a Peterborough-based writer and curator whose academic scholarship and curatorial work looks at the intersections between art and science, as well as the related fields of new media art history, criticism and preservation. She is known for the way her writing considers machine aesthetics and scientific approaches to cultural production and histories. Her website Shifting Polarities, produced while researcher in residence at The Daniel Langlois Foundation, tracks the history of electronic media in Canada and includes interviews with pioneers of media art. With Dr.
Gerald Grison, Stef Pete and Rebecca Simonetti present a collection of work that investigates formal hybridisms as a contemporary painting practice. Utilizing a variety of mediums, from the three-dimensional to the electronic, the artists in this show explore the possibilities of painting in a postmodern context. Dorkbot will be resuming Thursday, 4 Oct, 7:00 pm, at Interaccess, with what should be a very interesting set of work that examins natural/artifical, and urban/rural distinctions. Cary Peppermint and Christine Nadir (NYC) will be presenting their EcoArtTech (www.ecoarttech.net) project; Stan Krzyzanowski will present his Pine Cone Oscillator and Interval, his archive of work, and Patricia Rodriguez will be presenting her non-standard video work that examines urban and suburban spaces. Ask someone to draw you a picture of a “therapy session” and there’s a good chance you’ll wind up with a sad-faced guy stretched out on a chaise longue. Nearby, a bewhiskered, Freud-looking therapist will be taking notes and looking terribly wise. How old-school is that? Like so much else in our world, the new school of mental-health care is digital, and it’s all about increasing access to therapy and making it more affordable. That’s the vision of Chakameh Shafii, the co-founder and CEO of TranQool – launched on February 1, 2016. 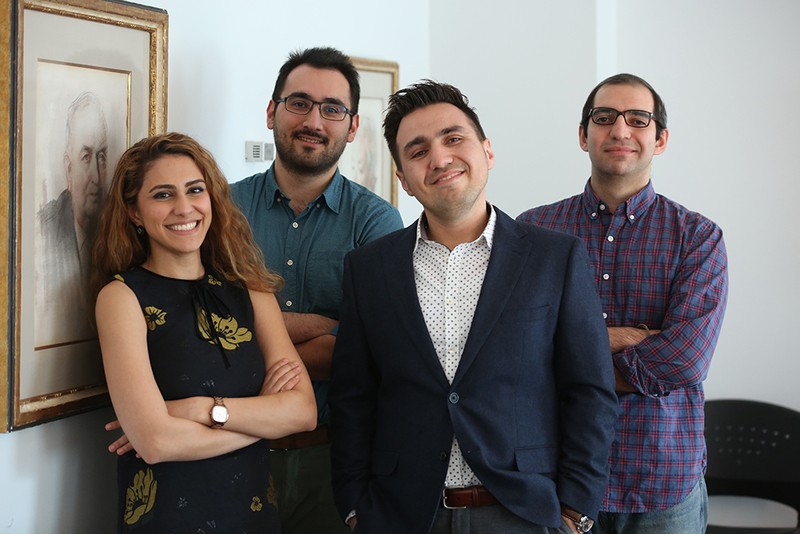 An engineer by training, Chakameh and her three colleagues (who are also engineers and co-founded the company) are members of OCAD University’s Imagination Catalyst. Together, they have applied the power of design to shape technology into a human-centric portal to mental-health care. InStudio caught up with Chakameh last week to learn more about her work and to see whether she had some advice for other entrepreneurs – read the short Q&A that follows. Then check out the two short videos. In the first one, Chakameh describes the origins and aims of TranQool, and talks about the union of human-centric design, science and technology. In the second video, she takes us inside her work with OCAD U’s business incubator and gives a shout out to the astonishing power of imagination. InStudio (IS): What is TranQool? Chakameh Shafii (CS): TranQool is a mental health platform designed for everyday people who need psychological therapy. It makes feeling better simple by providing quick, seamless and cost-effective access to qualified therapists. IS: What need does TranQool address, and who will it help? CS: Over 70 million North Americans live with mental distress, but less than a third of the people who need therapy actually seek help (I’ve blogged about this in the Huffington Post). TranQool aims to simplify the process by empowering users to overcome the barrier to access therapy. 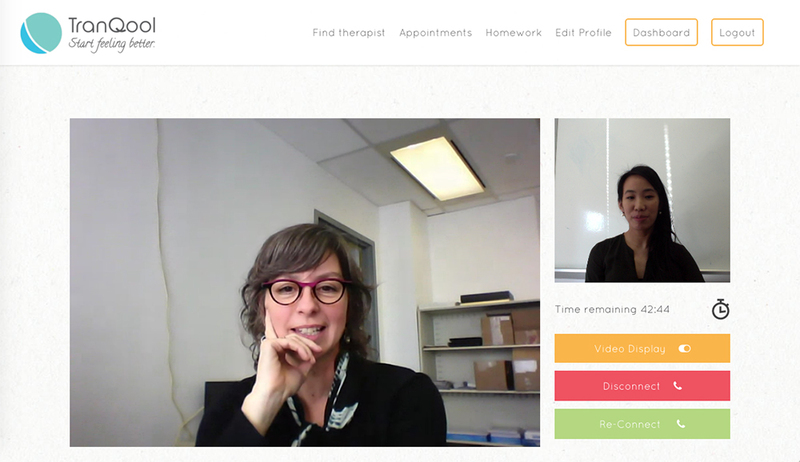 TranQool users won’t have to navigate the complicated health system to find a therapist they can trust. They will be able to have their therapy sessions from the comfort of home, at any time, at a cost-effective price. IS: What steps have you taken to develop TranQool? CS: We started by building a great core team and then assembling a network of advisors. With funding from a National Research Council grant, we then created our beta product in partnership with George Brown College. We’ve also made sure that TranQool is in line with all the applicable regulations around personal health information and therapy. And we’re finding that the TranQool blog is becoming a trusted source for people to get information they need to manage day-to-day stress and improve their mood. IS: What are the main benefits of belonging to the Imagination Catalyst? CS: Being an iCat means we have access to a pool of highly creative people inside OCAD U as well as an external network. This has helped us build a truly human-centric product. An added benefit has been the ability to access the level of mentorship and training we need to build our business on a solid foundation. IS: What’s your advice for other entrepreneurs? CS: Figure out the “why” of your life. Why are you doing what you are doing? Why are you doing it now? Why should you be doing it? Knowing the answers to those questions will help you to keep yourself motivated and on track. I also strongly recommend never shying away from asking for help and, when you’re able, to be open to helping others. It’s not just good karma. It’s good business. Calling all artists & designers at OCAD U! 1) Submit a digital art piece of any medium (photography, print, illustration, drawing, painting, anything 2D) that is 10”x10” and dpi of 300 pixels. 2) Submit a brief description of your original work; whether it is available or not, the size of it, and a rough estimate of how much you think the original work is worth. Email your work to 52cardshow@gmail.com by November 6th. 1) You will earn $15 if your works makes it to the show. 2) If your original work makes it you will get 80% of the commission. Calling all faculty and departments at OCAD U! Support your students by purchasing a print of their work! 52Cards is an event on Thursday, November 19th in which 52 students will showcase prints of their work. Show your support by purchasing a $25 dollar ticket, prior to the event. Your event ticket will be randomly matched with a print at the event that you can take home! If you have any questions, feel free to e-mail us! Moderated by Caroline Langill and featuring presentations by Judith Doyle, Lynne Heller, Martha Ladly, Nina Leo and Dot Tuer. In November 2014, the 20th International Symposium on Electronic Art was hosted by Zayed University in Dubai. One of the most important events for new media art, the symposium included over 200 interdisciplinary discussions and presentations of creative practices applying new technologies in electronic media. Please join us on January 30 for special presentations by OCAD University faculty and ISEA 2014 participants Judith Doyle, Lynne Heller, Martha Ladly, Nina Leo and Dot Tuer. The presentations will be followed by a roundtable discussion moderated by Caroline Langill on the future of electronic arts at OCAD U and beyond.